Vassiliki is a wonderful, picturesque, classical Greek fishing village located 38 kms south of Lefkada Town on the beautiful Ionian Island of the same name, Lefkada (Lefkas) and is 60 kms from Preveza airport. Vassiliki is the second largest holiday resort on the island, which lies around a beautiful bay, a long beach famous for its perfect windsurfing and sailing conditions. There are pebble and sandy beaches (Ponti) with crystal clear warm sea waters. The area of Ponti has been classed as one of the best worldwide for windsurfing because of the bay's ideal climatic conditions. Surrounded by evergreen slopes, the area offers the visitor a wonderful opportunity to explore the mountains as well as the chance to enjoy a number of activities such as horse riding and cycling. Ferry boats operate daily to and from the famous beach Porto Katsiki, Agiofili beach, Egremni beach, and the islands of Kephalonia and Ithaki. The village of Vassiliki itself is located on the eastern side of Vassiliki Bay and on the western side of the bay it is called Ponti. There is a coastal road between Vassiliki and Ponti, and the walk is pleasant and easy, or you can amble along the beach between the two. Season - Vassiliki is fairly quiet at the start and end of the summer holiday season, but really comes to life in July and August when it is recognised as one of the windsurfing capitals of Europe. The bay is wide and sheltered, and is noted for it's afternoon wind known as 'Eric'. On a good day, the wonderful sight of hundreds of windsurfers speeding across the water is very spectacular. The summer holiday season is from April through to early October. Bookings are now being taken for the Summer 2019 Holiday Season. Accommodation - A wide variety of accommodation is available in Vassiliki, including lovely hotels, apartments and villas. The accommodation meets International Standards. 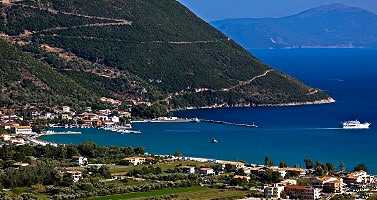 Preveza (Aktion) Airport / Vassiliki Transfers - We can meet you at the airport and transfer you to your hotel / apartment by car or by minibus and then take you back to the airport after your holiday. Beaches - Vassiliki beach is mainly pebble with some shingle and sands at Ponti, and is gently shelving. From the village you can also walk along the coastal path to the beautiful beach of Agiofili. This beach can also be reached by ferry taxi during the popular summer season. Harbour - There is a very pleasant traditional harbour front with lovely pavement cafes, restaurants, shops, and ice cream parlours. The harbour is a popular stopping off point for yachts and flotillas sailing around the Med and is also a boarding point for the daily ferry between the nearby lovely islands of Kefalonia (Cephalonia) and Ithaka. We can also arrange private speed boat charters to visit nearby beaches or islands. Services - There are numerous bars, traditional Greek tavernas and restaurants, and a disco. All food is deliciously home cooked. There are no banks, but there are ATM machines in Vassiliki village. Other facilities in the village include a Police Station, Medical Centre, Post Office, bakery, butchery, supermarkets and a petrol station. There is a public bus service to Lefkada Town and Nidri, which varies in frequency throughout the year. Bus tickets are inexpensive. Activities and Sports - There are some very pleasant walks along the bay, which is fairly flat. Vassiliki is best known for it's watersports - especially windsurfing and sailing. Tuition is also available. Water sports facilities and windsurfing clubs renting equipment are available along the bay. Many hotels offer bicycle hire. Scuba diving is also available.